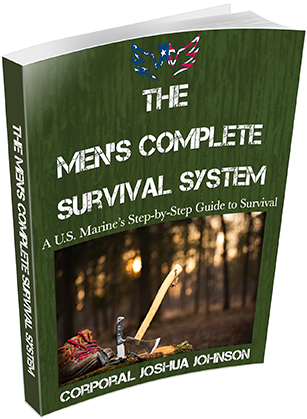 "The Men's Complete Survival System" NOW! "Consider Yourself Lucky! This Is The Best and Most Complete Survival System On The Planet!" Using my 8 years of experience and “know how” as a Marine, what I have developed is the ultimate system to Survival during a Government Collapse & Financial Crisis as well as other Man Made & Natural Disasters so you're prepared long BEFORE the "stuff" hits the fan! This system was created from a MAN’S perspective, specifically to help guys like you understand what is needed to take control, lead, and protect you and your family at all costs. You’ll get the facts you need on why the next disaster will be FAR worse than the Great Depression, and why it’s not a matter of if...but WHEN. Besides the obvious essentials such as First Aid kits, self defense weapons and canned goods…you'll get the nitty gritty and I'll walk you through step by step of all the vital gear you’ll need for survival, and how to make sure you choose the best of the best. You’ll have the ultimate bug out or bug in bag built before you know it. I’m going to provide the info you need to make sure your water supply never runs dry. With the most imminent cause for a national crisis at this point being a financial meltdown in the government, it’s only right I provide some financial secrets you should heed before and after the collapse. And so much MORE... You'll discover everything! UNADVERTISED BONUS - TODAY ONLY - When you grab your FREE copy of "The Men's Complete Survival System" today you also gain access to a full free 15-Day trial to my private membership, "Crisis Survival Guides". The Club keeps you continually updated with information on valuable skills, tricks, hacks, news, and early warnings of pending threats and spreading viruses. You'll also get detailed training courses (not available anywhere else) that will give you step-by-step preparation for any crisis or disaster, whether natural or man made. You'll also get offers for free gear like tools, knives, flashlights, firestarters, water purifiers and more. Our Club is well known and companies like to get our members involved to test and spread the word about their products. After the free 15-Day trial period, you'll be billed the discounted rate of $97 a month which will be conveniently charged to the same credit card you're using today. Of course, you can cancel any time and never be billed again by contacting our friendly support staff. This normally costs $200, but today it's yours free! Your family and friends will thank you and rest easy when they know you're always prepared for any crisis. Whether it be a financial crisis or a natural disaster, the "The Men's Complete Survival System" will reveal how to not only survive the crisis...but also THRIVE. "I must say there was a gaping hole in my survival resume, which now feels whole again after getting this system..."
"I consider myself darn near close to a survival expert myself, but was pleasantly a little shocked after getting your system and not feeling the urge to ask for a refund. (which I just KNEW I would do)"
"I thought the bug out bag I had been building for the last few years was complete, until I checked out page 17 that gives the FULL rundown of what I really need..."
"The fact that you are actually a Marine is a huge deal to me. The previous guides I purchased just didn't give me that same sense of authenticity and ability to virtually place me in the middle of the moment as your system was able to." "This is literally the coolest survival system I've ever owned. Much respect!"